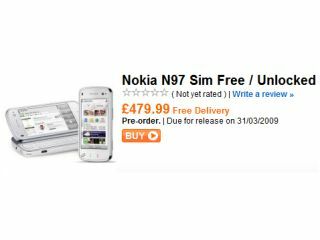 Nokia N97 hitting the UK in March? Nokia-lovers who enjoy a good touchscreen (but have been frankly disappointed by the Tube) will be pleased to know the N97 has been tipped for release in the UK during March. That's right, in just over two short months you could have your hands on the new toy that Finland's phone leviathan wants you to own. Well, according to Play.com anyway. It has recently put the N97 up for sale, the phone costing the sprightly sum of £480 with a penny change. The site's pre-order date says that the shiny QWERTY-toting touchscreen device will be delivered to your door ­­on 31 March - surely enough reason for Nokia lovers to start getting excited. TechRadar spoke to Nokia to see whether the Play.com rumours were true, but once again the standard 'no comment on speculation or rumours' answer was wheeled out. However, if the scenario with the Nokia N96 is anything to go by, we won't actually be seeing the N97 in shops until May. We expect it to be affected by the usual 'release and delay' cycle we've become grudgingly used to.